Product: Mashers Elika 100ml Clear Disposable Plastic Square Party Dessert Cups – Packs of 50 was added to cart. If you are looking for quality disposable tableware for an upcoming party or event, Mashers Elika Clear Disposable Plastic Square Dessert Cups will tick all the right boxes. Stylish, elegant, and designed to complement every buffet or table setting, they are made from durable plastic and can hold a 100ml serving of your choice. 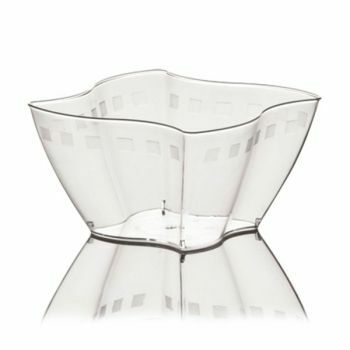 Ideal for miniature desserts, amuse bouche, finger foods, and party snacks, these quality throwaway party bowls can be washed and reused, and they are suitable for serving both warm and chilled foods.